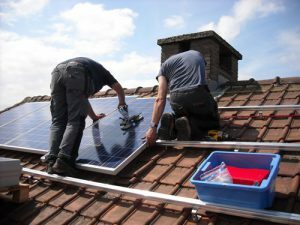 Contractors install solar panels on a house. California has made history by becoming the first state in the country to require solar power on new construction homes. The new building standard from the California Energy Commission is a big step in helping the state reach its goal of reducing energy use in residential homes by more than 50%. Starting Jan. 1, 2020, all new construction single-family homes, and multi-family homes with three stories or less are required to have solar power installed. The solar power is expected to reduce wasteful consumption of energy along with helping the environment. While the solar panels will drive up the cost of a house by $8,000 to $12,000, experts say the cost can be made up with energy savings. The estimated cost of solar power is $40 a month, which can save a homeowner at least $80 a month on electric bills. Contractors who install solar panels in California must have a contractor’s license. A solar contractor’s license allows a contractor to install, modify, maintain, and repair solar systems. In order to qualify for a license, a licensee must be at least 18 years old, have a social security number or ITIN, and have four years of experience in the trade. A college degree can substitute up to three years of the experience requirement. A part of the licensing process for California contractors is to obtain a performance surety bond for $15,000. The bond protects consumers by ensuring that a contractor successfully completes a project. California contractors who need to obtain a surety bond can contact SuretyGroup.com to get started. Our Surety Bond Specialists can give you a free, no-obligation quote. Our low rates and fast service can get you bonded quickly and easily. Call today at 844-432-6637 or email info@suretygroup.com.